In an earlier tutorial, I wrote about the very common type, class, and id contextual selectors that a lot of CSS rules use. Those aren’t the only types of selectors you can use, though. Slightly less common but extremely powerful are attribute selectors, and in this tutorial, you will learn all there is to know about them…and more! What is an Attribute Selector? Just to provide a quick recap, a CSS rule's selector specifies which elements in your DOM the rule will apply to. The contextual type, class, and id selectors match an element's tag type, class value, or id value respectively. A contextual selector is good for many cases, but it doesn’t provide you with the specificity you may sometimes desire. What I want to do is go one step further. I want to give two of the text input fields a different style based on whether the required attribute has been set on them or not. Notice what makes the first two text input fields different from the third one. The first two text input fields have an attribute called required (highlighted above). 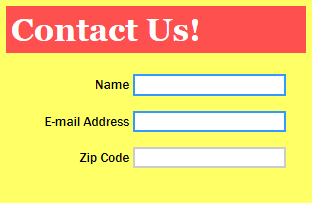 The third text input field doesn't. Let’s start with the simple example I talked about earlier and work our way towards more complicated ones. Our goal is to style all input elements that have the required attribute set on them. By using an attribute selector, you were able to use CSS to visually distinguish the elements with the required attribute from the input elements that do not have such an attribute declared. Right now, you don't care what the value of required actually is. As long as the required attribute exists in your input element, you want this CSS rule to apply. Checking if an attribute exists and applying a rule may not be enough. You may be in a situation where you want to apply a rule when the attribute not only exists, but it contains a particular value as well. There are severao variations in how you can match by the attribute's value, and in the following sections, let's look at each of those variations. This case is pretty straightforward. When you are doing an exact match, the attribute value you specify in your selector must match the attribute's value on your HTML element. If your attribute's value is misspelled or if it contains multiple values, this won't work. You must have an exact match. Notice that I have two CSS rules, and each rule has a selector specified for when the contentEditable attribute equals true or false. Because this is CSS, spacing doesn't matter. Feel free to add a space between the equals sign and the attribute name and value if you prefer. If you want to match a substring of your attribute value regardless of where it appears, use the *= character between the attribute and the attribute value. What I want to do is is style any URLs that happen to have the 'html5' substring differently than the rest. Notice that I tell my selector to match if html5 appears anywhere inside the href attribute's value. If your attribute value contains multiple words, this approach is flexible enough to find the substring inside any of the words. Wohoo! In the previous section, you saw how you can match a substring that occurs anywhere in your attribute value. If you want to constrain your search to just the beginning or the end of your attribute value, use the ^= or $= expression operators respectively. If you have a URL such as //www.kirupa.com/flash/images/parallax_ss.png where both your selectors' starting and ending conditions are met, standard cascading rules apply. Specifically, the rule declared last wins. If your attribute value is made up multiple words separated by a space, matching the substring at the beginning starts with the first word. Matching the substring towards the end works by looking at the last characters of the last word. You may think that having attributes with multiple words separated by a space is uncommon, and you are probably right. It isn't too common - especially in a situation where you want to style the element with such an attribute value differently. With the growing use of custom data- attributes, though, you may find yourself using custom attributes to give your elements an extra level of differentiation that you may not have had before. In those cases, you may have attribute values that are multiple words. If you wanted to style an element that matched one of those words, then you can always use the ~= operator. The last attribute selector variant we will look at is one that is primarily related to dealing with language subcodes. A language subcode is something like en-us, zh-tw, etc. If you deal with localization, you'll run into the lang or hreflang attribute with a language subcode frequently. The |= operator relating the attribute to the value is what makes this particular case work well. I'm primarily describing this for completeness. Outside of language-specific cases, I can't imagine you would ever want to use this attribute selector variant very frequently. So there you have it...attribute selectors. While you may not always need to use them, it is a handy tool to have in your HTML garage.